Signia Siemens Click Domes are a flexible silicone dome. These Domes click onto the end of a receiver that is used with a Receiver In the Canal (RIC) hearing aid by Signia Siemens and Rexton. Click Domes are available in several styles and sizes. The size of the Click Dome is related to your ear canal and the style of Click Dome is related to your hearing loss. The purpose of a Click Dome is to properly position the receiver in your ear canal and to provide the correct acoustics to optimize the performance of the Signia Siemens hearing aids or Rexton hearing aids. Signia Siemens Click Domes are available in double, closed, semi-open and open styles. Within each style the Click Domes are available in sizes from 4 mm to 12 mm. 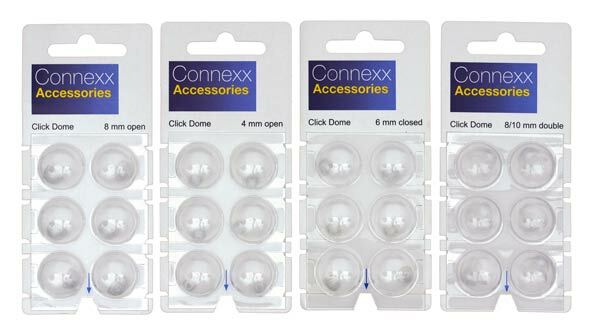 Price: A pack of six Connexx Click Domes is $8.65 ea. Call 800-877-1122 for Information or to Order. Signia Siemens Click Sleeves are a flexible silicone in an umbrella shape. These Sleeves click onto the receiver end of a Signia Siemens Silk Prinax CIC hearing aid or a inoX Rexton CIC hearing aid. Click Sleeves are available in vented and closed styles. Available sizes are xS, S, M and L. The size of the Click Sleeve is related to your ear canal and the style of Click Sleeve is related to your hearing loss. The purpose of a Click Sleeve is to allow the proper positioning of the hearing aid in your ear canal and to provide the correct acoustics to optimize the performance of the Signia Siemens hearing aids or Rexton hearing aids. 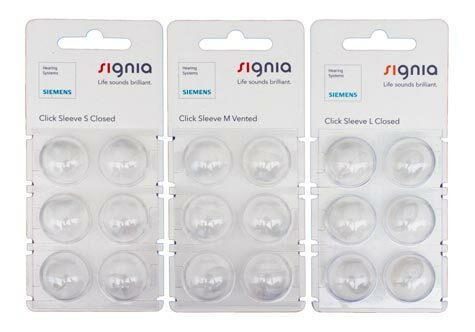 Signia Siemens Click Sleeves are available in vented or closed styles. Within each style the Click Sleeves are available in sizes xS, S, M and L.
Price: A pack of six Signia Siemens Click Sleeves is $14.00 ea. If you would like Click Domes or Click Sleeves shipped to you we generally ship USPS or UPS ground. Shipping costs generally range between $5.00 and $10.00 based on the quantity of batteries and the shipping requirements.